BOTH as an inexpensive touring two-seater and as a possible training type the latest Tipsy, which made a temporary demonstration visit from Belgium last ДальшеMore>>> week, is distinctly interesting. Those who have handled the single-seater model have only to be told that the flying and control characteristics of the new machine are similar to, but a trifle less light than, the former to know all they really need to know about it from the pilot's point of view. Structurally, too, the machines are largely identical, though there has been a considerable cleaning up in the matter of detail and the fuselage has naturally had to be modified to suit the new circumstances. Though the machine might be classed generally as a side-by-side seater, the Tipsy's occupants are, in fact (I will not say "appropriately"! ), staggered in relation to one another, with the result that each has a very reasonable amount of elbow room - which is difficult enough to provide in the widest of fuselages. There are dual rudder pedals just ahead of the main spar and a central stick. When used for instruction an extension will be fitted to this control and a second throttle arranged on the left side so that it can be held quite comfortably by the instructor whose arm, in any case, is behind the pupil's back. In all probability, the production machines will be optionally enclosed, but the prototype is fitted with a deep curved screen which satisfactorily shelters the pilot if not the passenger. Various changes, both in the matter of cockpit shape and furnishing, will be made in the production model and there is little point in either praising or criticizing the accommodation as it appears at present. The two-seater model only flew for the first time a week or two ago and such details can only be settled in actual flying tests. The machine is at present fitted with a four-in-line 50 h.p. Walter Mikron engine - and a very neat little installation it makes - but it has not yet been decided whether this unit will be fitted to the production models. It is unlikely, in any case, that these will be coming through Aero Engines' shops before the end of this year, and by then there may be one or two suitable engines to be obtained in this country. The Mikron is a most delightful little engine to fly behind and all things considered, provides just the right sort of performance - with a take-off which is quite astounding, even in a flat calm such as prevailed during the demonstration. The maximum speed with this engine is as high as 124 m.p.h. and the price in the region of ^400. Naturally enough such an exceptional performance can only be obtained by the strictest attention to exterior detail, and the machine is as clean as the proverbial whistle. So much so that the production type will assuredly be fitted with manually operated split flaps. Although it was not possible last Friday, for insurance and other reasons, to make more than a passenger flight in the new machine, Mr. Wesson brought over the latest single-seater with the new dual-ignition Sprite engine, and I managed to borrow this for a quarter of an hour or so while London's smoke blew up from the north-east. My previous experience with the Tipsy had been confined to the original version with a rigid undercarriage, and the latest type is very different on the ground. Dual ignition, too, inspires one with confidence. It is impossible to deny that the Tipsy is the most delightful of flying machines. Though the controls are light to the point of being without feel and are exceptionally powerful, there is no question of over-sensitivity. Full aileron, for instance, is necessary when entering and leaving vertical turns, and one can move both stick and rudder bar about quite roughly without coming to any harm. It would be hard to think of any machine in which the pilot feels more "part and parcel" of it. Care is required during the approach since speed is gathered very rapidly and the hold-off from an over-fast approach is almost indefinitely prolonged in a flat calm, but the view from the pilot's seat is so good that one is encouraged to loiter on the aerodrome boundary in a series of gentle gliding turns. Incidentally, too, the hold-off is prolonged only in time, and the distance covered is not very great. For small-field approaches it would probably be better to come in with a good deal of engine and as near to the stall - which is quite sudden - as one dares. That is a matter for practice and personal preference. 50 h.p. Walter Mikron engine. Maximum all-up weight 992 lb. The Tipsy B Two-seat Light Monoplane with enclosed cockpit (60 h.p. Walter "Mikron II" engine). Expanded for two, the Tipsy has lost none of its good looks. The Tipsy two-seater which is now in production at Hanworth. It is, of course, a natural development of the single-seater Tipsy and is intended as an economical trainer or tourer. 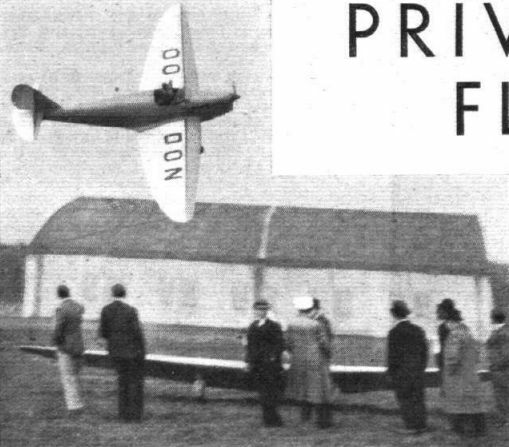 The British Tipsy Two-seat Light Monoplane (62 h.p. Walter "Mikron" engine). One and two: The latest single-seater Tipsy (nearest camera) alongside the new two-seater. The Tipsy BC Two-seat Light Cabin Monoplane with enclosed cockpit (60 h.p. Walter "Mikron II" engine). 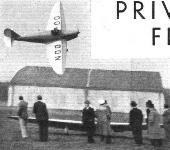 Two views of Tipsy two-seater production at the London Air Park factory at Hanworth in Middlesex. 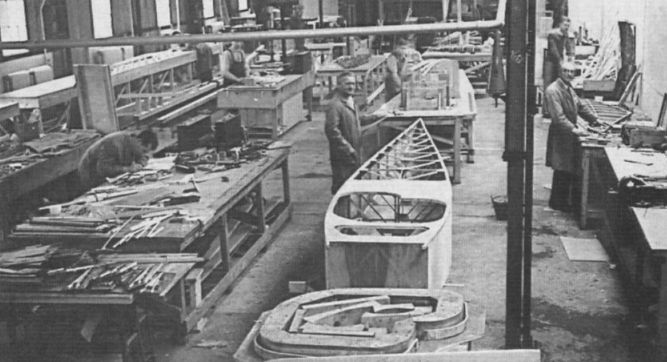 Tipsy two-seater fuselages under construction at Hanworth.